As a boy, Robert Morris remembers his grandfather talking about his war wounds at the Sunday dinner table. It was interesting, but Morris didn't understand what it really meant. What puzzled the child has inspired the man. Morris's new book, Black Faces of War, gathers the stories of black servicemen and women, from the Revolutionary War to the present. Every American conflict has its black heroes, and Black Faces of War tells their stories, many in the form of first person narratives. The book begins with a story of the Revolutionary War. Some 25,000 black troops fought then, most with the British, who had promised them freedom. The Americans, led by slave-owner General George Washington, had a conflicted view of black soldiers in their ranks. 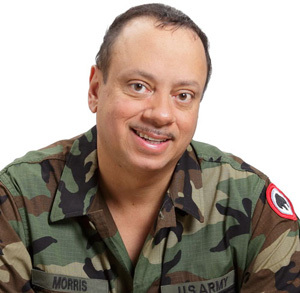 Also among Morris's stories is the account of his grandfather's best friend, James W. Mitchell, who served as a lieutenant in the Marine Corps during World War I. A member of the U.S. Army's first black officer candidate class at Fort Des Moines, Iowa, he fought valiantly at Belleau Wood in 1918. Yet when he returned home to Georgia a hero in 1919, he barely escaped death by lynching. "If you were black," says Morris, 82BA, "you had no rights at all." African-American women also get their due in Black Faces of War—from Harriet Tubman, a runaway slave leader who served as a scout and spy for the Union Army in the Civil War, to Charity Adams, the first African-American officer in the Women's Army Auxiliary Corps during World War II, who also trained at Fort Des Moines. Morris was born to write their stories. His own family, thick with distinguished military history, also played a role in the black press. His grandfather owned the Iowa Bystander, the oldest black weekly newspaper west of the Mississippi, while Morris later served as the Bystander's editor and as a guest columnist for the Des Moines Register. His first book, Tradition and Valor, told his family's story and was made into an award-winning Iowa Public Television documentary. He also helped found the Fort Des Moines Museum and WWII Tuskegee Airmen Memorial Education Center, which commemorates blacks in the military. "These are great people." Morris says. "It is an honor for me to tell their stories." UI film students examine media that capture the essence of America's pioneering spirit. An aging woman's reflections to her caregiver. (The debut piece from the Iowa Writers' Workshop. From the DI to the White House. Her journalism career started at the Daily Iowan, and now Leslie Yazel is executive editor of Cosmopolitan.